The great Hajj pilgrimage to Mecca is one of the five ‘pillars’ of Islam, required of every Muslim who is fit and able to undertake it. Every year in the month of Dhu al-Hijja, millions of Muslims converge on this desert city on the Arabian Peninsula from all corners of the globe, in one of the world’s greatest and most spiritual human gatherings. 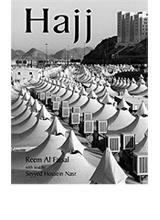 Saudi princess and photographer Reem Al Faisal here brings together a portrait of the Hajj in an extraordinary collection of black-and-white photographs that reveal not just the vast scale of the pilgrimage, not just the range of rituals involved, but also the human dimension: the sheer variety of humanity that comes here, the private moments of piety and devotion, the intimate moments of relaxation, and the joy (and sometimes anxiety) of being a part of such an immense community of people in a common purpose. Reem Al Faisal is a granddaughter of the Saudi king Feisal. Her photographs have been exhibited in France, Egypt, China, and Korea, and Palestine. Seyyed Hossein Nasr is professor of Islamic studies at George Washington University, and the author of more than thirty books on philosophy and religion.